Traditional Pork Sausage "Bangers" for sale. Buy online at Zingerman's Mail Order. Gourmet Gifts. Food Gifts. Home > More > New! 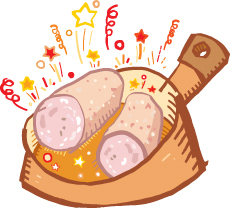 > Traditional Pork Sausage "Bangers"
Nick Spencer is a British ex-pat living in Chicago and he’s made his living selling the flavors of home (like blood puddings and back bacon) here in the states. Every British person I know living stateside says his stuff tastes just like home. Some think better. These fully cooked pork sausages—colloquially called "bangers" across the British Isles—are key to frying up a traditional English breakfast at home. Heat up the bangers in the oven or on the stove, with eggs (cooked however you like), bacon (the kind the Brits call "streaky" but we just think of regular bacon), roasted tomatoes (cherry variety, still on the vine if possible), toast and of course tea. You can add some roasted mushrooms as well as baked beans to the plate if you want to go Full English Breakast, but that's the basics. Personally, I'd hold off on the beans and mushrooms, but don’t skip the roasted tomatoes. They’re a revelation.